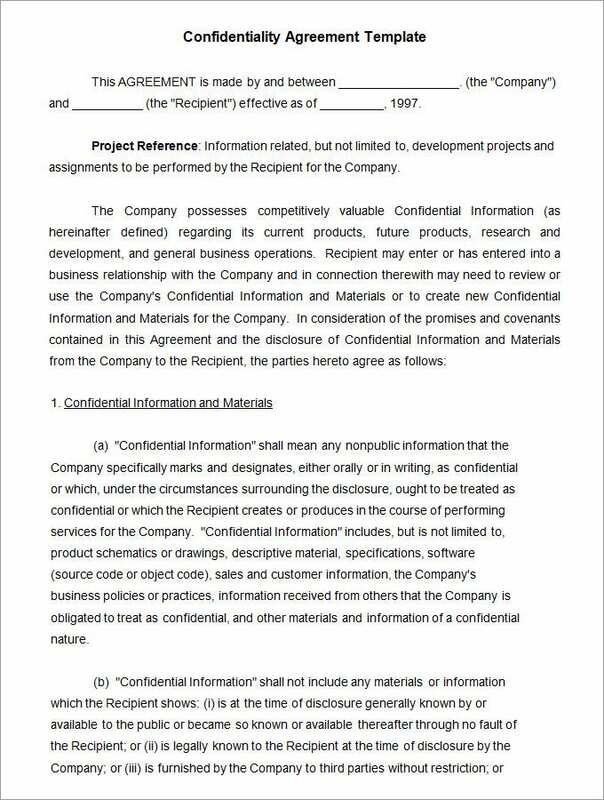 Confidentiality Agreement Templates – 9+ Free Word Documents Download! 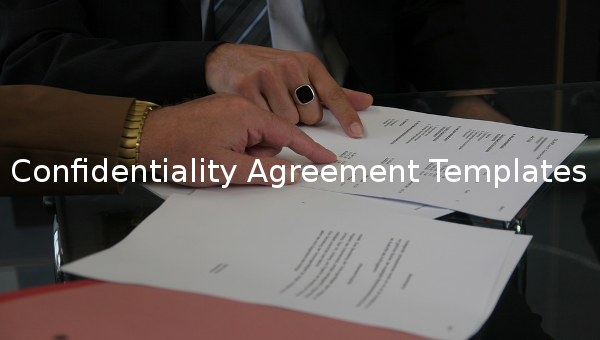 People who need to sign and prepare confidentiality agreements for a lot of works can use the confidentiality simple agreement templates to ease their work and save a lot of time. 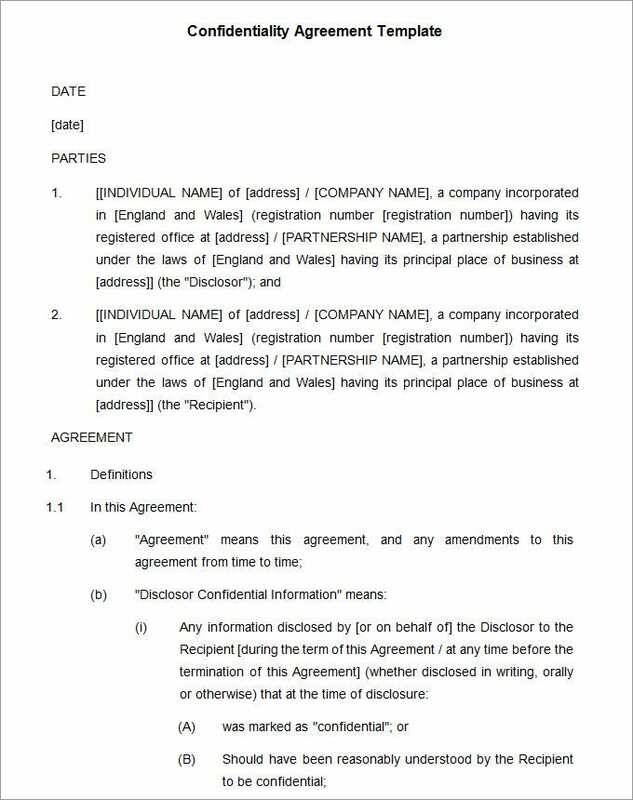 Confidentiality agreement forms are available on the internet which are designed categorically and with all major clauses incorporated and can be used simply by taking a print out and filling the minute details. You can also see Rental Agreement Templates here. 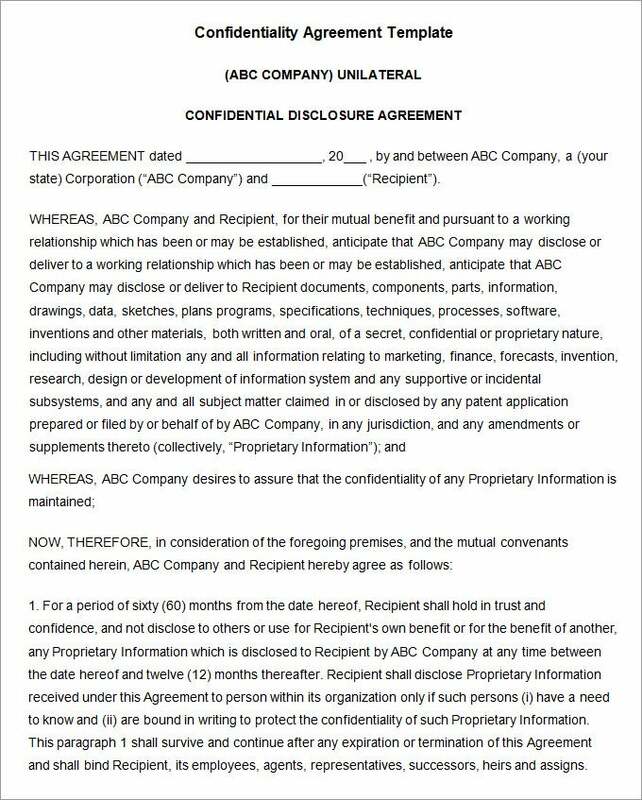 You can also use the employee confidentiality free agreement templates for word to make bonds with the employees in your organization and you can also get the flexibility of adding your own clauses and rules.Companies can opt for various sample agreement templates while framing their documents to get a good knowledge of the content and also prepare a fool proof agreement. You can merge and customize the features of several agreement templates like partnership agreement template,loan agreement template,purchase agreement template and more..!! you can get the one which suits all your requirements and fits in all your clauses.The confidentiality agreement website design Agreement Templates are also available if you want to extend the confidentiality of your website or design one and then you can simply fill in the details and take a print to make the final document. In order to protect company secrets shared with a third party, a confidentiality agreement is necessary. Download a PDF template here and make the agreement quickly and legally binding to the parties. This simple confidentiality template can be used in any organization when agreeing with another business or an individual. It is available in Word format from which you can customize it as desired. 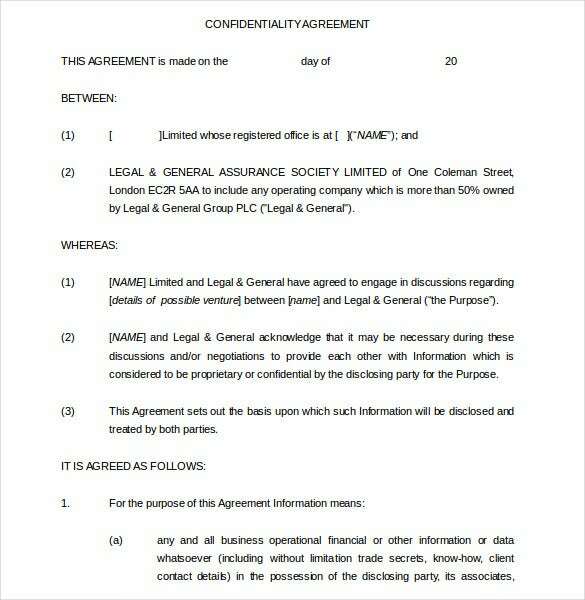 With this sample confidentiality agreement template you can come up with your unique agreement. You can download it in both Word and PDF so as to customize as you see fit. 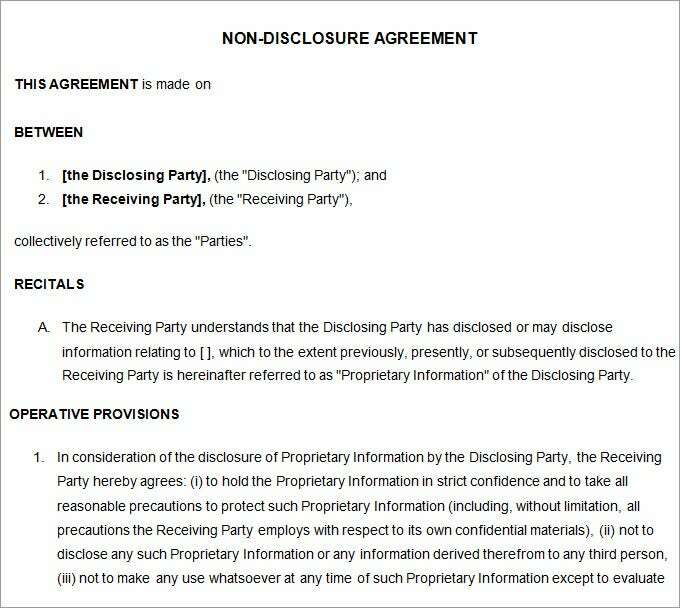 It is prudent to sign non disclosure agreements with whoever you deal with closely in your business. This ensures protection of business secrets. It is available in Word file format. cpaaustralia.com.au | This agreement is used to ensure both parties keep the secrets of one another. 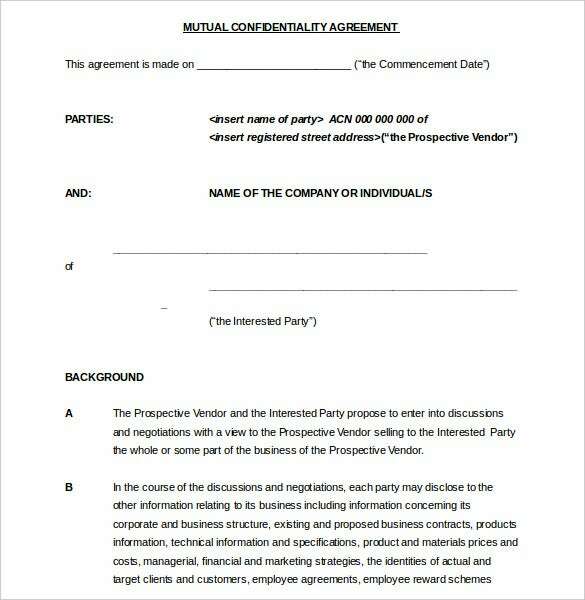 Use our professionally designed confidentiality agreement template available in Word format. You can edit the clauses any way you desire. legalandgeneral.com | When working with another party closely in business or as a contractor a confidentiality agreement is required to protect your interest. 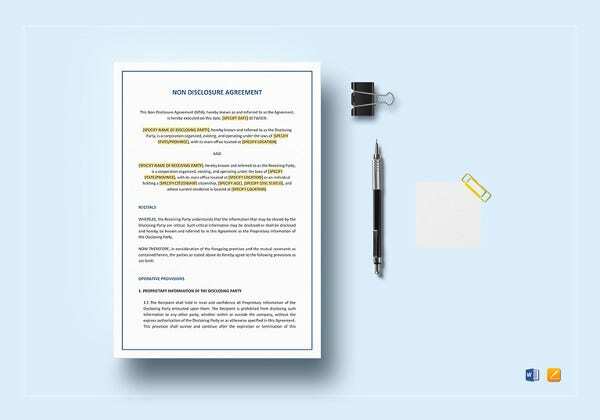 Use this special Word format agreement template to create your agreement. secf.org | This confidentiality agreement is done between the organization and its employees. This protects the company from information breach through the employee. 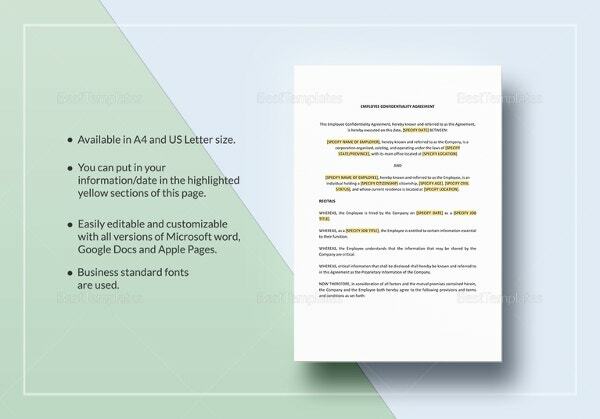 Get the template in PDF format and create the agreement. 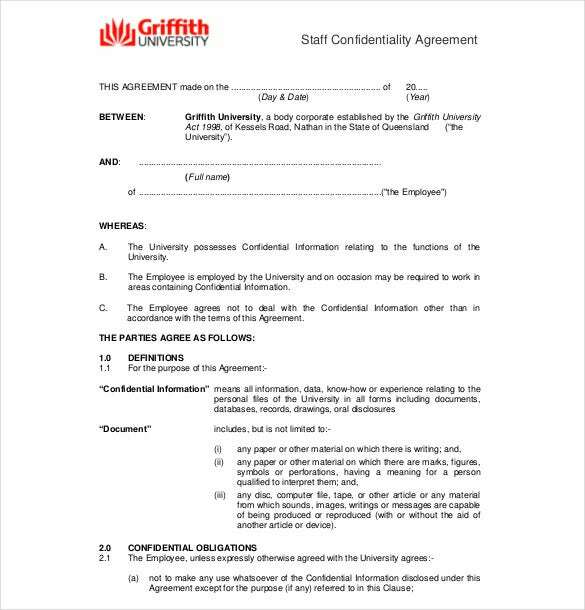 policies.griffith.edu.au | This staff confidentiality agreement template is meant for signing with the staff in order to keep them from sharing secrets with unauthorized parties. It is readily available in PDF format.